Our feet are one of the most overlooked parts in our daily beauty routine. 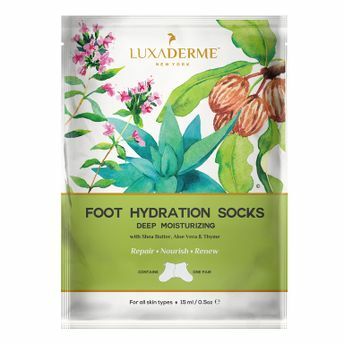 LuxaDerme Foot Hydration Socks contain a nutrient and moisture rich solution ideal for those who look forward to pampering their dry, rough and tired feet. It uplifts your feet by reviving the skin and restoring the moisture. This disposable foot socks feature dual layer technology, containing a rich blend of potent botanical extracts and antioxidants to delivers nutrition deep into your feet, giving a hydrated and a youthful look. Helps soften your cuticles and nourishes nails. It also increases feet's suppleness and keeps them smooth and refreshed, all in less than 30 minutes. It is easy to use, effective, non messy and non sticky. Free from any chemical and synthetic ingredient that may prove harmful to your skin. It comes in durable foil packet and is travel friendly. Lavender and Thyme Extracts: Have powerful anti-bacterial, anti-fungal and anti-viral properties that helps keep the feet clean. Note: This mask does not contain any Paraben, Sulphates (SLS), Phthalates, Petrolatum, Heavy Metals, Alcohol, Artificial Colours or Fragrances.